The funeral has taken place at Poole Crematorium of H A (Harry) Pearce, the very first motorcycle road race winner at Brands Hatch, who passed away peacefully aged 94, after a short illness. Originally from Surbiton, Surrey, he was a regular trials and scrambles competitor before taking up road racing in the Manx Grand Prix in 1948. He become a successful performer on his home-prepared Triumph, and in winning that first Brands road race beat a young John Surtees (also on a Triumph) to define his place in history. 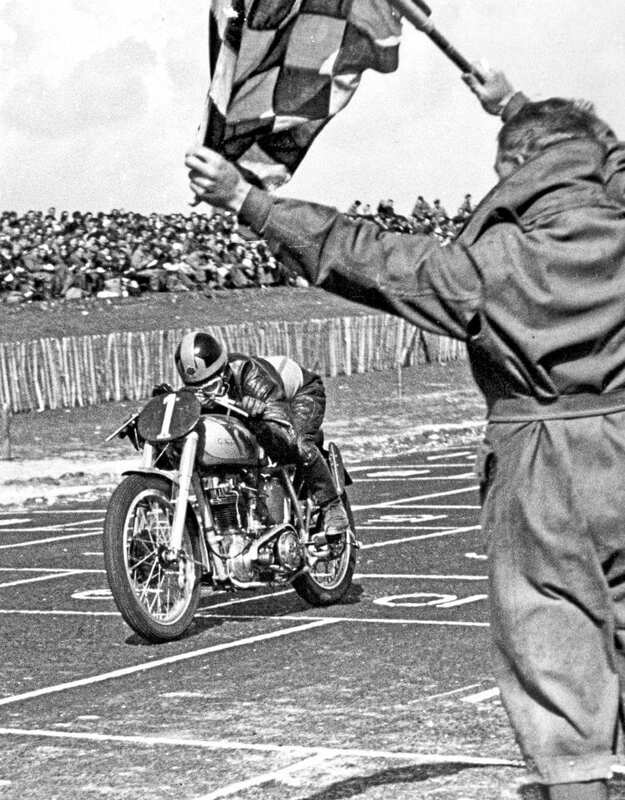 History in the making as, tucked in as tightly as humanly possible, H A (Harry) Pearce takes victory in the first road race at Brands Hatch in 1950. Harry went on to become one of the most consistent 350cc finishers on his Velocette MkV111, winning the junior class in the 1952 North West 200 by a minute and 39 seconds and setting the fastest lap at 83.753mph in the process. The following year he finished just a second behind winner Bob McIntyre. until he hung up his leathers and sold his MkVIII in 1955, but carried on working for CT Atkins, albeit now in car racing. A new and exciting chapter in Harry’s racing history came when he became mechanic to a young Bruce McLaren, later becoming production manager at the factory. No 546), of which he was a founder member. Read more News and Features in the August issue of OBM – available now!